Goodness infused with flavor. Mangia! Shake onto pizza, hot or cold pasta, garlic bread or roasted vegetables. 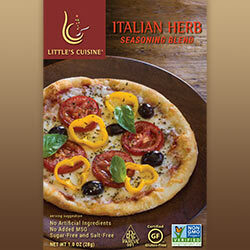 It's our perfect blend of Italian seasonings that gives any dish a taste of Italy. Ingredients: Spices (Basil, Chili Pepper, Fennel, Oregano, Rosemary, Black Pepper, Marjoram, Cumin, Red Pepper, Thyme), Dehydrated Garlic, Onion. No artificial ingredients, no added MSG, sugar-free, salt-free, certified gluten-free, kosher and non-GMO project verified.